Which version of Pacman do you like most? Where's Super Pac-Man? Where's Pac-Land? Where's Pac-N-Pal? Where's Pac-Man Championship Edition & DX ? All covered in the choice called "other". I've just never really enjoyed Pac Man all that much. It always feels so hopeless. I guess every arcade game does to some extent. I suppose I need to take the time to try and understand the ghost patterns, but I don't really care enough to get that into it. I voted for Baby because I like the dual game idea. I wish there had been more of those. Nah, memorizing patterns would make the game too mechanical and not fun anymore. Part of the thrill of evading the ghosts is not absolutely knowing how they will respond in a given situation. I've studied the physics somewhat as to how Blinky chases pacman directly and another chases a point in front of Pacman, and the third ghost uses a point equidistant to Pacman and the second ghost. Clyde/Sue is supposedly random but there's all logic to it. But when I'm playing, there's no time to mentally calculate that a certain ghost will take route A or B depending on how I tilt the joystick. I just see an escape path and go for it and hope I don't get ambushed! I have to go with Ms. Pac-Man here. I love the original, but Ms. Pac has it all over the original game. Also, it was the one classic arcade game I could always find as the years went by, at least up until 2002 when our K-Mart closed down. In fact, I think that was the same machine I had played since it was fairly new at our old Hecks store. Pac-Mania comes in second due to the variety and the fact you can jump over the ghosts. That is a neat twist. Oh man! I so remember when K-Marts had arcades! For us it was in the '80s and then newer locations or changed locations did not have them. Ours had some weird and somewhat obscure games too like Pulsar, Satan's Hollow, and Tunnel Hunt. This would effectively make patterns in Pac-man impossible since you'd have to have a pattern that accounts for every possible combination of Blinky and Pinky's initial movements. Even if you could make up all those patterns, on every level you'd have to recognize which pattern you need on the fly. Maybe a computer could do it, but I doubt a human could consistently. Who am I kidding though, even with this change someone would have achieved a perfect Pac-man score by this time. I realize, this being more a retro/arcade site than anything else, the poll is mostly aimed at the maze games... I chose Ms. PacMan. Recently, I purchased the PacMan World console series for PS1, and PS2, and have enjoyed them. They aren't Grand Theft Auto meets PacMan or anything epic, but for standard platformers, they are great and do a good job of Pac-Theme integration into a 3D Platformer-Puzzle World. I would buy others if the series was continued. Indeed. Pacman World series games do have their charm, though they don't exactly take the place of AAA platformer / adventure games like Mario, Zelda, Little Big Planet, or Ratchet and Clank. I found the latter stages of Pacman World 2, especially the FPS sequence with the bombs and the spooky world with the roller blades to be a bit on the frustrating side. I never finished the game, but always wondered what the special prize when I unlocked 180 tokens to finish the museum. The built in arcade games were also a fun diversion although they don't play well on the Game Cube Dpad. I think you would enjoy playing Ms Pac-Attack. It is a vintage hack of Ms Pacman with new mazes. I liked it because they are playable and not stupid difficult like most modern hacks. It's available as a mode in 7800 Pacman Collection, which I highly recommend picking up if you own a 7800. Sometimes I'll play a straight game in Ms Pac-Attack mode if I'm not in the mood for random mazes. I enjoyed it enough that I would consider getting an alternate set of EPROMs to swap out if I had an original Ms Pacman Arcade cab. Original arcade pacman has always been my favorite. The donut dazzler pattern was always great fun. It would amaze those watching you play and there was still some challenge left because all four energizers were left over at the end so you could go after them in various ways. Mspacman is a close second on my favorites list, however. I know that a lot of people find Ms. Pac-Man superior (specifically because it built upon a great game and added enormous value to it), but I am still more partial to the original plain ol' yellow guy. It helps also that I have very fond memories of having Pac-Man fever when I was 10 or 11 years old: I had Pac-Man bedsheets and pillow cases, Pac-Man stickers and posters on my wall, Pac-Man trading cards (with that icky bubble gum! ), and even bought the Pac-Man Fever album from Buckner & Garcia! P.S. I don't recall having a Pac-Man t-shirt, but I did have a Yoda shirt that I wore everywhere. Oh, and my fever was cured a year or two later, when I contracted E.T.-everything Fever when that movie came out. I was a nerdy kid for sure. Edited by DZ-Jay, Sat May 14, 2016 5:39 AM. I love both, but IMO memorizing patterns takes the fun and challenge out of the game. Kinda glad they broke pattern memorization with Ms Pacman. That said, it's amazing those ghosts do not do an about face and destroy pacman! In Pacman a lot of the fun we had was coming up with the patterns in the first place.. tweaking them, sharing them via word of mouth, learning by watching others etc... that to me was a big part of it's appeal after you got over the initial appeal of the game. But, I do agree that I'm glad it stayed with Pacman and Ms. Pacman mixed it up. Edited by NE146, Mon May 23, 2016 5:01 PM. 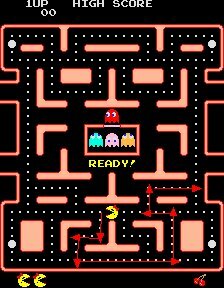 I think it may be possible to develop a "pattern" for Ms Pacman, by following an opening segment and then changing the path once it is determined visually which "home zone" got assigned to each of the four ghosts. But for that, one may have to memorize 16-24 different pattern sets which all diverge from the opening sequence, and choose the correct path immediately based on ghost behavior. The opening for all combinations of the path would remain unchanged until all ghosts are in their home zones before diverging. This would be incredibly difficult to program into muscle memory but could potentially be done. It is also possible that an identical pathway could be discovered resulting in completion of the maze with every possible starting combination of ghost behaviors, by using a brute force algorithm. Such an algorithm, if one exists would likely not score all the possible point bonuses for catching the ghosts. There was also an episode of The Cleveland Show where Cleveland Jr was telling his stepdad Robert (Donna's ex, Roberta and Rollo's dad) about how he discovered a pattern in Ms Pacman. LOL neat! Edited by NE146, Mon May 23, 2016 6:42 PM. A8 'Pac-Man Arcade' is simply wonderful. It's the one that I keep playing, along with 5200/A8 'Super Pac-Man'. Jr Pacman by far! I have an original tabletop ms pac which I like very much but JR is better. I really like the VCS version. There's something original about it. I'm a teen who loves Atari. Shocking, isn't it? I don't get why people hate the original Pac-Man so much. Sure It doesn't play anything like the arcade, but it's still fun. In my opinion, the Ebivision version of Pac-Man for the 2600 is the worst. Primarily because it's so slow. Edited by Atari PAC-MAN Fan, Sat May 13, 2017 1:06 PM. I have to admit, even I kinda like the 2600 version of Pacman. Best way to look at it is like some of the adaptations made to work on handheld and tabletop games of the era. It just has its own unique flavor. Hmm, I might have to dig my cart out again now.. Token yearly bump nice. If anyone is following this thread for the first time, be sure to check out the "New Pacman for VCS" by Dintar816. It's amazing, and the fact they got the TIA audio nearly perfect is nothing short of incredible. Until then, I've got my "cigar box" version to keep me entertained! Had to throw another vote down on the missus. Seriously, as much as I really enjoy the original, put them side by side and I wouldn't give it more than a quarter or two at most because I like the change up of the mazes Ms Pac-Man offers. Edited by Tanooki, Sat May 13, 2017 11:00 PM. 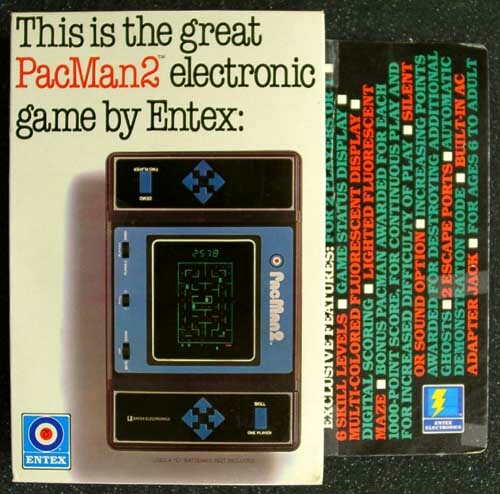 I think the best Pac-Man handheld is PacMan 2 by Entex. I have this one complete in box. Edited by Atari PAC-MAN Fan, Sun May 14, 2017 6:40 AM. I've seen a couple of those in the last few years locally at flea markets/garage sales and every time the damn thing has a roached battery compartment which is unfortunate. There was one time it didn't, dude wanted the boxed price for it and I snickered and walked away which was a shame. I've seen it recorded online and you're right it is a solid version. I've had Entex stuff before, but the best one would be the tabletop Crazy Climber which was ridiculously challenging but fun to play.